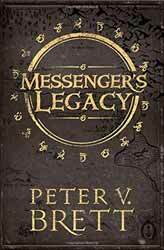 Peter V. Brett’s quintet of novels covering the Demon Cycle has been well received both by critics and the reading public. He has created a richly envisioned environment against which to plot his story and characters which readers have found easy to empathise with. The novella focuses, though not exclusively, on Briar a young boy at the start of the novel, but a character who would appear as a man in the The Skull Throne. In the introduction Brett admits that the story started life as the opening chapter of The Daylight War, but that it grew too large to be just a chapter and so was set aside. The incomplete version was later published in a charity anthology and now it sees the light of day in its completed form. The novella works on a number of levels. For fans of the main story you get a look at some of the characters backgrounds. Ragen appears and we get to know a little more about his relationship with Arlen and how he became involved with Briar's life. But, you do not need to have read anything else as the novella is complete enough to stand on its own. At its heart it is a story of loss and redemption, of a boy lost in a world plagued by numerous types of demons. The only defence against the nightly intrusion of the demons are the wards, magical symbols which repel them. Yet, alone and with no support, Briar is able to survive each night with just his wits to keep him alive. For the how and why he finds himself in this position and what his relationship with Ragen is, well you’ll just have to read it. Given that the creation of short form literature is more difficult to coherently create Brett has offered up another satisfying slice of fantasy.